ECA is committed to the inclusion of every child in early childhood education and care. Inclusion means that every child has access to, participates meaningfully in, and experiences positive outcomes from early childhood education and care programs. Inclusion resources are an important part of how we support high quality early childhood education and care. You can access these resources and links from this page. Inclusion ensures that all children participate meaningfully while learning and interacting in programs that acknowledge each child’s strengths and interests, so that they are supported to be active members of their community. Inclusion is important for many reasons. It implements current thinking about child development; supports children’s rights; implements the legal standards for early childhood education and care; and is good professional practice. Inclusion fosters diversity and overcomes any barriers that might exist to ensure that every child experiences quality early childhood education and care. View the Statement on the inclusion of children in early childhood education and care. Please also find the accompanying Factsheet on The experience of inclusion and exclusion in early childhood education and care available for download here. 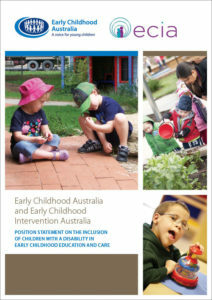 Early Childhood Australia (ECA) collaborated with Early Childhood Intervention Australia (ECIA) to produce a Joint statement on the inclusion of children with disability in early childhood education and care. 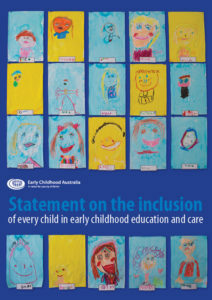 This joint position statement by ECA and ECIA sets out our shared commitment to inclusion in early childhood education and care (ECEC). Its purpose is to create a vision for high quality inclusive practices in early childhood education and care. It will assist everyone in ECEC services, as well as support professionals, to fully include children with a disability and to achieve high quality outcomes for all children. It will also provide a framework for the development and implementation of policy and programs designed for all young children. The inclusive practices promoted by the position statement are characterised by the strong collaborative partnerships between children, families, early childhood educators and support professionals that are widely recognised as a cornerstone of high quality inclusive practice in ECEC programs. View the Statement on inclusion of children with disability.